Scrap This, Save That: SMASH*aholics UNITE!! All I can say is OMG! 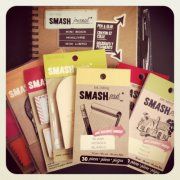 As many of you who read my post about Swagbucks know, I recently jumped on the Smashbook bandwagon. I ordered some books and goodies from Amazon. I looked through everything, I organized it, I tried doing a page or two, then I just sat and stared at it. Smashing is super simple, but for some reason, I just wasn't sure where to start. I wanted to do a book about me...but what am I supposed to say or write about? Then...the other day I was on Facebook and found THE most awesome group ever!!! You can find them on Facebook by searching SMASH*aholics. These peeps are some serious smashers!!!! They have all been posting pics of absolutely beautiful pages they've made. I've had SO MUCH inspiration, that I am now officially Smashing like a maniac!!!! If you're on Facebook, go check them out! It's an open group, you just need to click the button to send a request to get in. PS...I think I'm finally starting to feel better, thank goodness! I plan to be back on here pretty quick, with a vengance! Woohoo! That's smashing to hear that you are feeling better. Thanks for the info on the smash stuff I'm going to check it out. Thanks for sharing this!!!! I got a smash book in Nov and decided just last week what to do with it (a book about me lol) and I had no idea where to start!!! I am happy to hear you have found a great source of inspiration to get you going with all your new goodies! Have fun!!! I want to check this out! Thanks for stopping by! HI, Amy Thanks for stopping by my blog. Yes we will be in Bremerton. Ya I have craft buddy. Sorry to hear you were sick but happy to hear your getting better. We are in Taxes now we stayed in Ft Sheppard AFB. Amy, I'm not sure is Georgie is really focusing well enough with the new glasses for it to be making a difference yet. She is little so really hasn't been saying much. I have noticed that when something is up close she raises them up and looks instead of looking through the glasses. It's The LAST Of The Calendar Pages! Aaaaaaand Some More Calendar Pages! Oh Geez, More Calendar Pages?